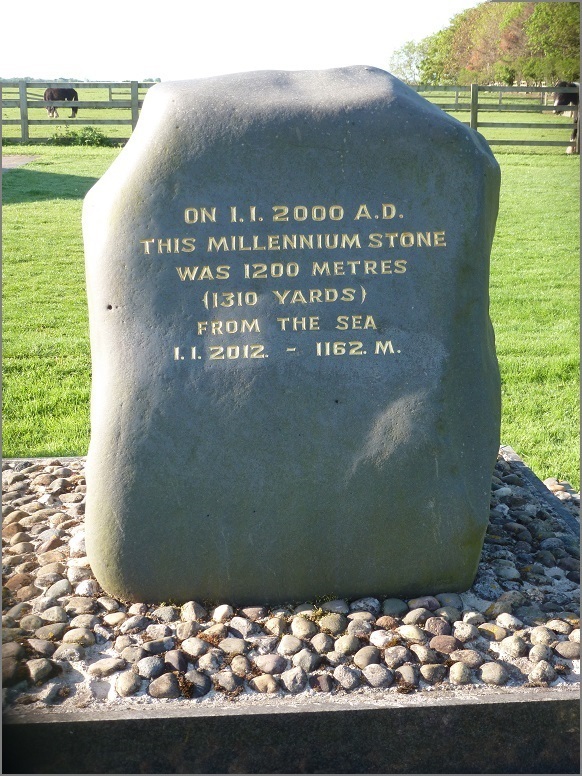 Millennium Stone, Barmston & Fraisthorpe Village Hall. One update is added, indicating an erosion rate of 3.17 metres per year. Inscriptions marking distance from the sea are to be found at various places along the receding coastline of the East Riding of Yorkshire. They may be specifically installed, as above, or set into properties when built (for an example from Holmpton, see cliffs page, pictures 49 and 50). Full depiction of the cliff line position became possible at the middle of the nineteeth century with the Ordnance Survey. One more century was to pass before the introduction of a systematic measurement of cliff recession using posts, then a further half century until technology improved and comprehensive monitoring started, with readings taken along notional lines called profiles. 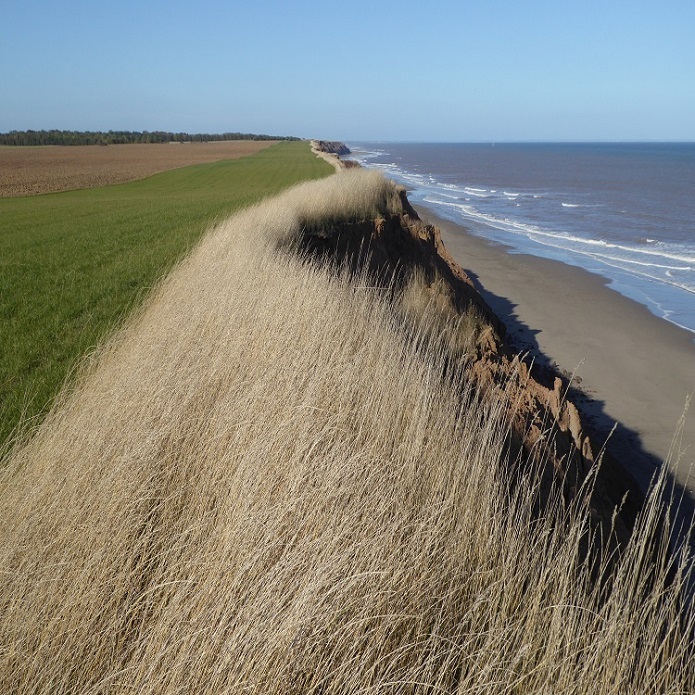 This page considers in turn the three ‘eras’ of East Yorkshire coastal erosion measurement. The Ordnance Survey brought a new accuracy to map-making for its time. Comparisons of the cliff line in periodic revisions of the OS map provide an estimate of cliff loss between dates. Coastal positions are represented according to what was observed at a particular stage of a survey. Sometimes the cliff is shown in a style suggesting that this should not be regarded as a certain feature. The earliest relevant sheets are catalogued in the National Library of Scotland old maps collection as follows (click sheet number to open). East Riding of Yorkshire Council publishes data prepared from OS maps. Sample locations are the same as for the current profile plan so that continuity of measurement may be maintained. Seven comparisons of the full coast can be made from the information. There are omissions – see the table below. Where cliff loss is not recorded in one survey, a cumulative value appears in the data for the next. Additional to full coast, six map-based surveys relate to defence structures. Context is available at the terminal groyne effect page. Hartmut Hans Burchard Valentin was born on 8th January 1923 in Marienberg, a town in Saxony, Germany. In 1949 he received a PhD from the Freie Universität Berlin (Free University of Berlin), his dissertation leading the way to a book of some note, Die Kusten der Erde (The Coasts of the Earth, 1952). He was Professor of Geography at the Technische Universität (Technical University) in Berlin from 1962 until his death in 1977. During the early 1950s, Valentin spent two years or so at Cambridge. He wrote about Britain’s tilting land movements (the hingeline in part running through East Yorkshire), on morainic topography in Holderness, and conducted a coastal survey. A draft of the survey was presented in a festscrift, a group tribute to an academic, on a return to Germany. In 1954, the work was published as ‘Der Landverlust in Holderness, Ostengland, von 1852 bis 1952’ in the journal Die Erde (The Earth). Some seventeen years later, a translation appeared as a chapter in a collection edited by James Alfred Steers, Applied Coastal Geomorphology (1971). The contribution bears the title ‘Land Loss at Holderness’. Valentin relates how, in 1952, he used a 100-foot tape to measure distances of the cliff top from nearby topographical features which he was also able to identify on the earliest six-inch OS maps (1:10,560). By this means he calculated rates of erosion along the East Yorkshire coast from Sewerby to Spurn (Holderness actually starts at Skipsea) over a period of one hundred years. “Altogether 307 observations were obtained at intervals of approximately 200 m. along the 61.5-km. stretch of coast.” Approximate because, “It was impossible to space the observations at precisely regular intervals of 200 m. owing to the difficulty in finding suitable topographic reference points.” The latter part of the comment is bound to resonate with anyone attempting a similar exercise. Results are given as an average annual rate for each location, and a rate for parishes, rather than actual distances of cliff recession. In the English version of the work, currently available as a purchased download, a column containing 34 entries - 11% of the total - is absent from Table 7.1. The table shows land loss-and-gain data and is therefore arguably the most important information produced by the study. The lapse almost certainly occurred outside the control of the original author. Within the table as displayed, a typographical error is present. In order for the average for Bridlington to be true, the value at location (TA) 180 662 has, like those for neighbouring locations, to be negative. To obtain the complete table, recourse is made to the publication in (Valentin’s native) German. This is available online, webpage or pdf, as archive material at no charge. Where access to a site (e.g. military) was not possible, and resort had to be made to a comparison of two OS maps, he expresses concern over a possible combined margin of error of +/- 6m, ‘and hence these data cannot be considered to be very reliable.’ It is not stated which entries might be affected. Valentin’s 307 observation points are identified in the table by six-figure grid references, accurate to 100 metres. Average distance between coordinates calculates to 206 metres. According to the writer, “Lack of space precludes a detailed description of the locations of the points at which the measurements were made.” Points outnumber present monitoring profiles, which are mostly 500 metres apart though precisely defined, by two-and-a-half to one. The Valentin survey achieves what it was meant to be - an attempt, as the author puts it, to ‘fill a little of this gap’ in assessing quantitatively the loss of land in Holderness. However, the method has limitations. No idea of trend is possible, nor of varying rates within the hundred years, including any changes resulting from the construction of defences and cessation of beach mining. Data, as published by ERYC and compiled from OS maps (above), may be used to estimate cliff loss from 1852-1854 to 1952-1956, nominally 101 years. The Valentin survey covers essentially the same period. In the chart, the two sources are compared. From south of Bridlington to Hornsea, and from Withernsea to Spurn, with the exception of a short stretch across the Easington-Kilnsea dunes (where, certainly in recent times, no cliff line as such can be said to exist), there is a respectable match between the two survey sources. Valentin recognises erosional loss at the main sea defence sites whereas the ERYC data table voids these places. The trace from Hornsea to Withernsea is less of a fit, Valentin’s figures supporting a greater rate of erosion. In the middle of the section, around Aldbrough, the mismatch becomes significant. A check of early OS maps favours the amber trace line. When, for example, cliff line positions along monitoring profile 62 near to Seaside Road at Aldbrough are compared, the maps suggest an underestimation in the blue line data over the period 1852/1854 to 1888/1891. Loss calculated from the check produces an annual rate of erosion at the Aldbrough location of 1.15 metres, which compares with the 1.13 metres proposed by Valentin. The ERYC data table returns an annual rate of 0.76 metres. Further support for a higher historical rate of mid-coast erosion appears elsewhere. To coincide with a return to Hull after almost seventy years by the British Association for the Advancement of Science (annual meetings were held in a different provincial town or city, or sometimes abroad), locally based Charles Thompson conducted a survey of the amount of changes ‘suffered’ by the Holderness coast during the period. Thompson, whose interests covered ammonites and cephalopods, fossil examples of which may be found in the East Yorkshire glacial clays, undertook 66 measurements employing a methodology similar to the one Valentin was to use thirty years later. Field observations were compared against cliff positions as drawn on the first OS sheets. The results were published by the Yorkshire Geological Society in 1923 under the title 'The erosion of the Holderness coast’. Distances of cliff loss are recorded – in feet – from which annual rates derive. Locations, many of them now disappeared, are not accompanied by grid references (Aldbrough and Ringbrough are spelt -borough). Thompson's sample size is just over one-fifth of Valentin's. Nonetheless, erosion rates are of the same order of magnitude. With reference to the check example above, the measurement line entered in the Thompson data as H under sheet 213 lies about 18 metres north of monitoring profile 62. Thompson proposes an average there which converts to 1.22 metres per year. An average for the first 74 years of the check (1852-1855 to 1925-1929) is 1.19 metres per year. In 1951, a system of physical measurement was introduced by the local authority responsible for the coastline. The authority at the time was East Riding County Council. This became part of a new Humberside County Council on 1st April 1974. The larger body was broken up after twenty-two years and the present authority, East Riding of Yorkshire Council, was formed on 1st April 1996. Cliff loss monitoring continued throughout the administrative changes. A series of fixed reference points behind the cliff line was established from which measurements could be taken at intervals and cliff recession calculated. The points were known as monitoring posts or stations, and even exposure posts, later called Erosion Posts (EPs), but might be corners of buildings or pillboxes. Measurement was by tape until 2003 after which coordinates of posts were coupled to GPS readings, and from 2009 to LiDAR equipment. By the very nature of the process being monitored, posts at times needed to be repositioned (193 occasions, including posts repositioned more than once) or perhaps re-established (5 occasions). In principle, surveys were conducted annually before 1991, then twice a year, though there are spaces and gaps in the data. Posts 1 to 31, Sewerby to Skirlington, went unchecked for twelve years, apart from five readings, before a major repositioning in November 1983. The system of numbering as shown in the panel below and in the data spreadsheets represents a final order. At first, districts had separate series. It may be assumed that the MoD site at Cowden presented an obstacle to the setting up of posts under the original plan. The ground was used by the army from 1939 as a tank range and training for the Home Guard, and taken over by the RAF for firing practice in 1959. When RAF operations ceased in 1998, three erosion posts were installed on roadways within the site. The new posts were labelled R1 to R3, with a fourth installed to the south of the site as 58a. Erosion posts, requiring suitable reference points, were located at intervals which average 518 metres but with wide variation. Positions only loosely align with current monitoring profiles. Nine can be regarded as being equivalent, while 13 are close by, and a further 32 are found within 100 metres. In the chart below, annual rates of erosion from data produced over the erosion post era are compared against data available in tables compiled from maps and monitoring profiles for the same period. On the whole, allowing for limited alignment, the fit is good. One exceptional spike appears in the amber trace post records that is not seen in the blue. EP57 (installed 1993) appertains to the situation at the end of Garthends Lane, Cowden – see Great Colden page. The EP method brought the advantage of being able to observe changes in the cliff line over relatively short time scales and with more precision than from scrutiny of drawn maps. Notwithstanding breaks and numerous repositionings of posts, the records allow some useful analysis of trends and patterns not possible over lengthy periods between surveys. Results from the use of the satellite-based Global Positioning System (GPS) for cliff loss monitoring appear in the data at 1999. Coastal defences were the object of the last of the OS map surveys, and continued to be for the first measurements aided by GPS. The arrival of GPS technology removed the need for physical reference points from which to take measurements. While erosion posts went on providing data, a system of notional lines called monitoring profiles was initiated (there is a fifteen season overlap). Each profile line extends about one-and-one-third kilometres from a coordinate inland of the coast to another out to sea, crossing the cliff line at right-angles. At a seaside frontage, the upper edge of the structure serves as the land base. Intervals between profile intersects along the cliff top are approximately 500 metres except in three instances. One profile provision is absent across Bridlington Harbour, the distance between profiles 5 and 6 being doubled. Adjustments are made to accommodate curvature of the coast, at Barmston (profiles 17-18 distance is extended by over 100 metres), and north of Cowden (profiles 53-54 distance is reduced by 100 metres). Profiles allocated for frontages at Bridlington (3-7), Hornsea (42-44), Withernsea (90-93), for defences at Easington (110-112), and across the Easington-Kilnsea dunes (115-117) return no records. Any determinable cliff line for profile 123 at Neck of Spurn was lost in the storm surge of December 2013. Recently, profiles (124-136) were introduced to monitor the vulnerable Spurn peninsula. Twice-yearly GPS-based records run from March 2003 for all monitoring profiles except at two locations near Kilnsea. These are Profile 118, a reading for September 2004 but otherwise resuming March 2007, and Profile 120, resuming March 2005. Monitoring profiles not only provide cliff loss data at particular locations but information about the beach. The sets are available at ERYC Coastal Explorer Beach Profiles (one record is missing for a season in 2006 because of a funding cut). In erosion year 2008-2009, Light Detection and Ranging (LiDAR) replaced GPS. At the same time, beach level contours were recorded allowing movement of sediment to be followed. An example is included in the Layer List at the Coastal Explorer Interactive Map. The Coastal Explorer Interactive Map also shows the most recently published cliff line. By the term ‘cliff line’ is meant the top edge of the cliff, where land comes to an end and which profiles cross at a right angle. Published erosion tables based on the monitoring profile plan are compiled from measurements taken along the line of the profile. Sometimes a maximum loss may be quoted. Not to be confused with the biggest value against a profile in the tables, this is the greatest difference between cliff lines of two seasons observed within the profile section. Each section extends laterally either side of the profile line, a distance normally of 250 metres. It is possible to calculate digitally the total area between cliff lines and produce an estimate of land loss, thereby reducing distortions that arise when exceptional losses coincide with sample points. The method is not currently applied on a practical scale. A new cliff line appears as a slide begins. 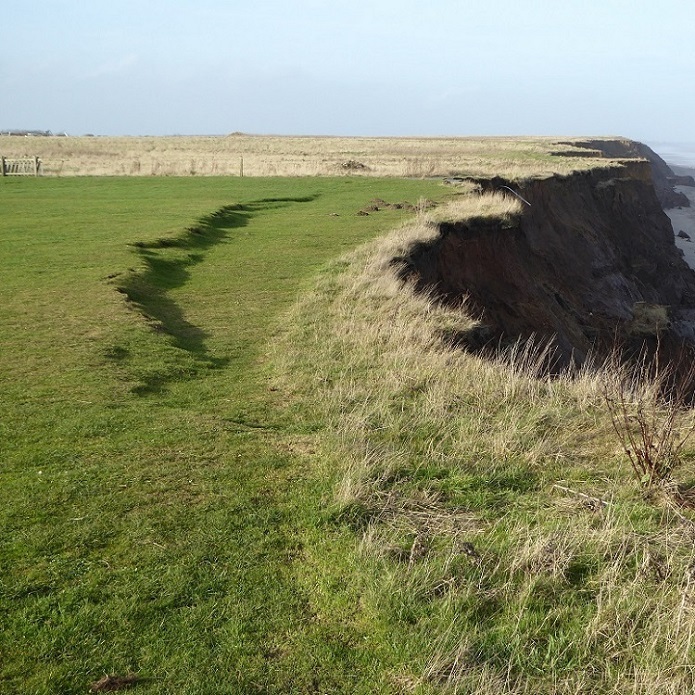 The emerging cliff edge in the immediate foreground and at the far end of the grassed area is difficult to determine but may be assumed [Aldbrough: 3 February 2017]. The edge of the cliff is obscured by a previous season’s ungathered crop. Beneath the growth are cracks and an uneven surface which make closer investigation hazardous [Hilston: 22 October 2018]. Page prepared by Brian Williams in spring 2017. Last update November 2018.